[Written at the top of page:] you spoke about putting up Ventiltor in Cattle Shead I think it Should be not less than 6 ft long by about 4 wide & four high for the sise of so large a Shead- and use fence Boords [illegible] [in a?] to and nailed on. & [Coner? Conet?] 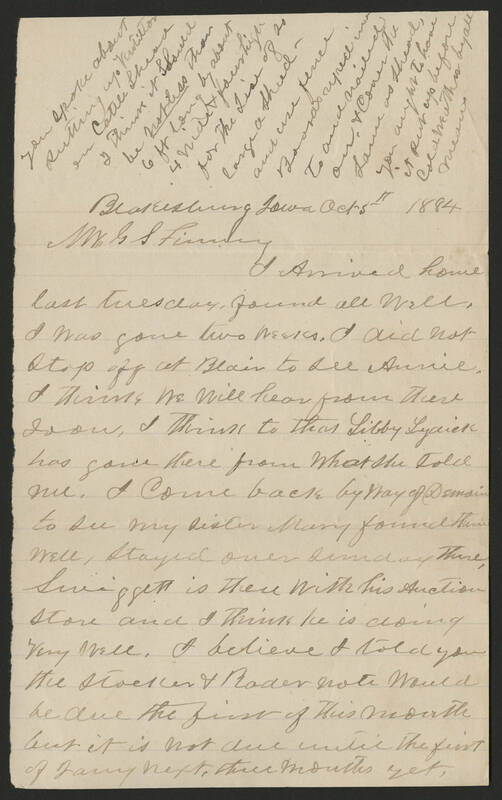 the [illegible] as Shead, you aught to have it put up before Cold Weather by all means Blakesburg Iowa Oct 5th 1884 Mr . G S Finney I Arrived home last tuesday, found all Well. I was gone two weeks. I did not stop off at Blair to see Annie. I think we will hear from there soon. I think to that Libby Lydick has gone there from What she told me. I Come back by Way of Demoin to see my sister Mary found them well, stayed over sunday there, [Siveggett?] is there with his Auction store and I think he is doing very well. I believe I told you the stocker & Rader note would be due the first of this month but it is not due until the first of Jany next, three months yet.